If you buy into the stereotypical caricature of French food as a rarefied haute cuisine that abhors any sort of perfidious Anglo-Saxon influence, then the very idea of French burgers is oxymoronic. That stereotype, like any crass over-generalisation, is of course untrue – evident to anyone who’s chowed down on hearty, unfussy French dishes such as cassoulet, andouilette or ratatouille. 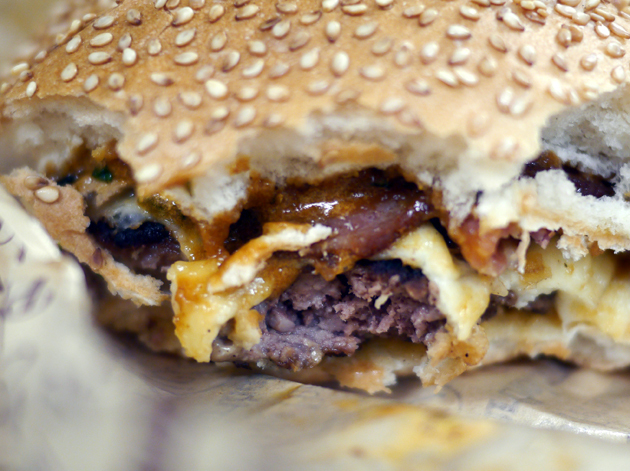 Burgers are just as popular in France’s big cities as they are anywhere else. Big Fernand is a small, mainly Parisian burger chain that’s just opened its first branch in London just off Tottenham Court Road in Fitzrovia. Some think that Londoners must have burger fatigue after the burger restaurant deluge of recent years, but someone forgot to tell that to the hordes of punters filling up Big Fernand across all six of my visits. The decor is Barnyard-lite with its exposed and uneven wooden and brick surfaces. You order at the till and pick up your order at the other end of the counter. The process is usually quite quick, but if there’s a delay then there’s not really enough space on the ground floor for lots of waiting punters. The predominantly Gallic staff were clad in somewhat goofy flat caps and chequered shirts, but were all dashingly attractive nonetheless. They were all incredibly warm, friendly and efficient too – busting another groundless French stereotype, that of the huffy and snooty waiter. If you live nearby or just fancy a picnic, take away is an option. Although the standfirst above says ‘every burger reviewed’, that’s not really true. You can customise your burger from the meat in the patty and how it’s cooked to which cheeses, toppings and sauces are used so there are endless variations. I have eaten all six main burgers though and certain recurring themes emerge across all six. 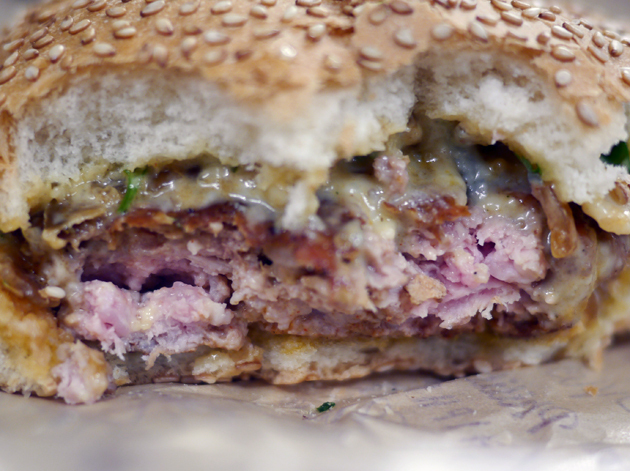 The eponymous Le Big Fernand uses a finely ground beef patty that nonetheless retained some chewiness to it. Like any sensible person, I ordered mine medium rare although what I received was more medium to medium well. In any case, the patty was drowned out by the exceedingly sweet burger sauce, the mild tang of the tommie de savoie cheese and the small hint of umaminess from the slice of sundried tomato. 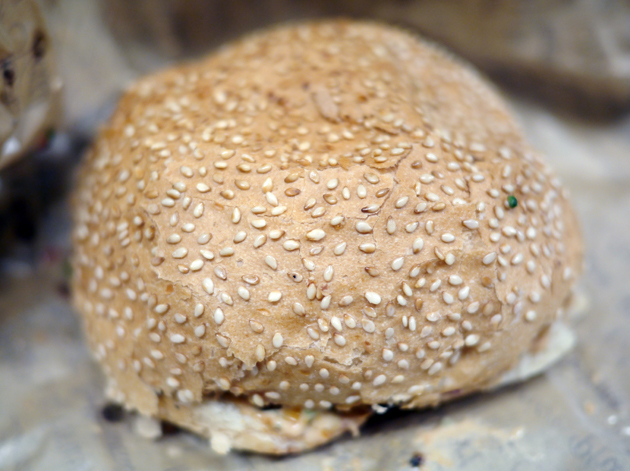 The bun did a good job of holding everything together, but the notable nuttiness of its sesame seeds was just another element crowding out the beef. 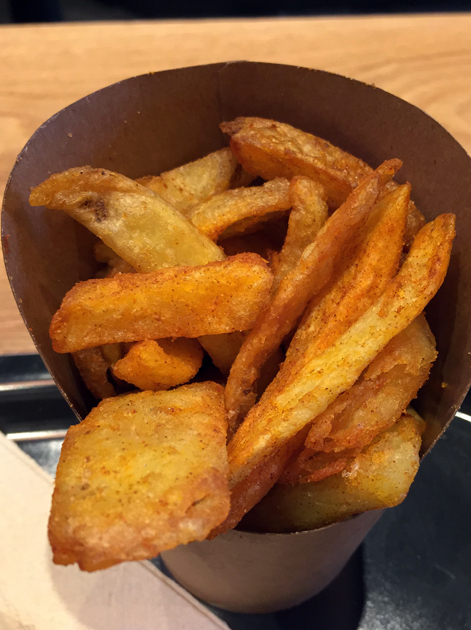 The chips were formed from whole slices of potato rather than reconstituted mush. Although fluffy on the inside, the exterior was too soft and not crisp enough for my liking. 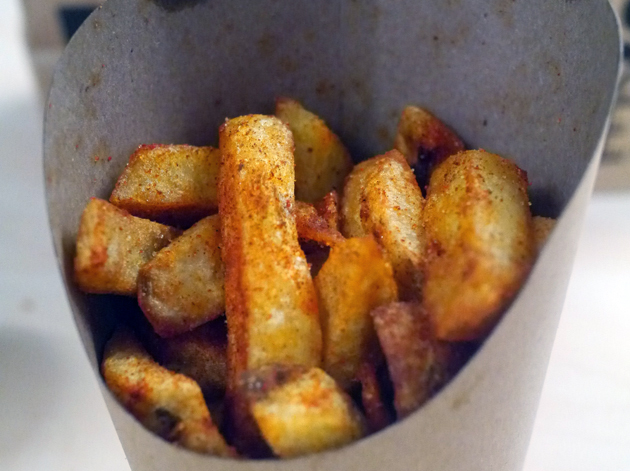 If you’re trying to reduce your salt intake, then you should ask the comely staff to hold the paprika salt dusted on top – the stuff is salty enough to sap every last drop of moisture from your maw. Like Le Big Fernand, Le Bartolome uses a beef patty which was a little chewier this time around and was cooked the right side of pink when ordered medium rare. 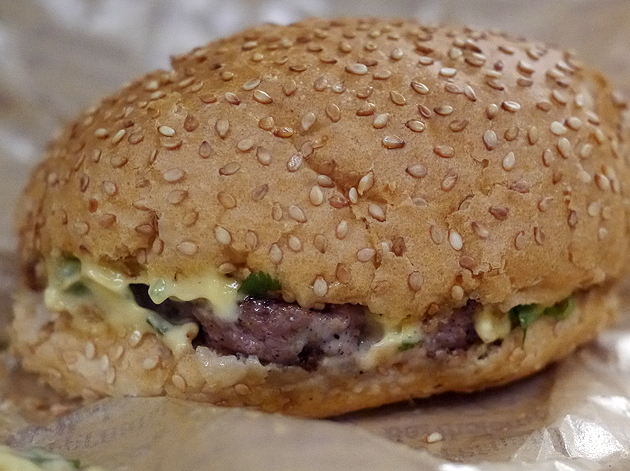 Le Bartolome is essentially Big Fernand’s take on a bacon cheeseburger. The raclette was pleasingly creamy and unctous and, surprisingly, didn’t clash with the crisp and sharp chives. 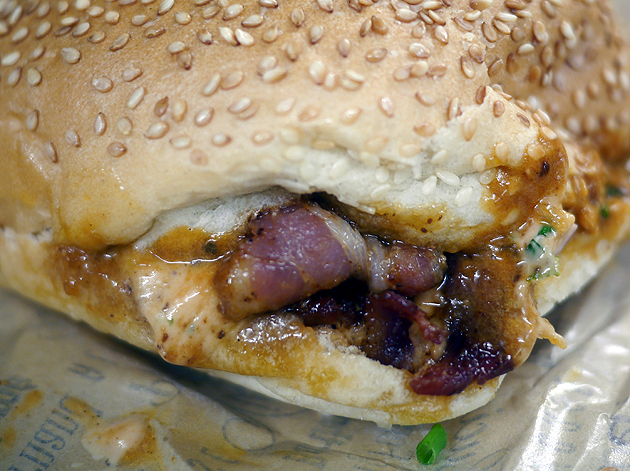 The patty once again took a back seat to more attention-grabbing elements – crisp rashers of bacon and caramelised onions which were boldly sweet. I could’ve done without the sweet tang of the cheap barbecue sauce – it felt very out of place. Vegetarians only have one pre-set option – Le Lucien. 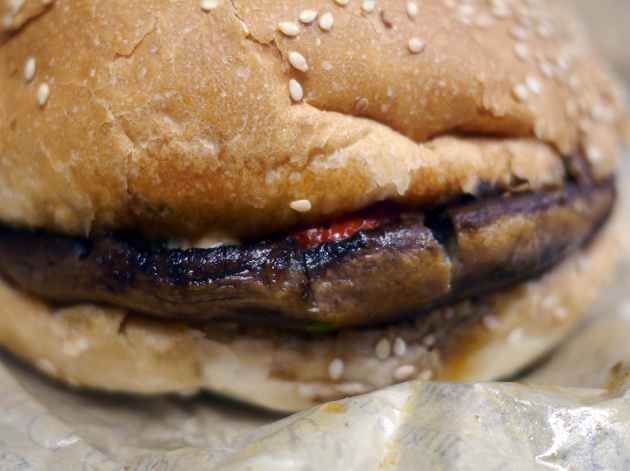 Smooth, meaty and inoffensive mushrooms took the place of the meat. The caramelised onions were barely a presence, with the now requisite sweetness provided by the powerfully flavoursome sun dried tomatoes instead. The red onions were suitably crisp, but the tommie de savoie was curiously muted this time around. A more welcome surprise was the buns used in both Le Bartolome and Le Lucien which weren’t as distractingly nutty as the one used in Le Big Fernand. Chicken breast is the least interesting part of the entire bird. While it makes up a significant proportion of edible chook, it’s very bland compared to a nice bit of thigh and leg. 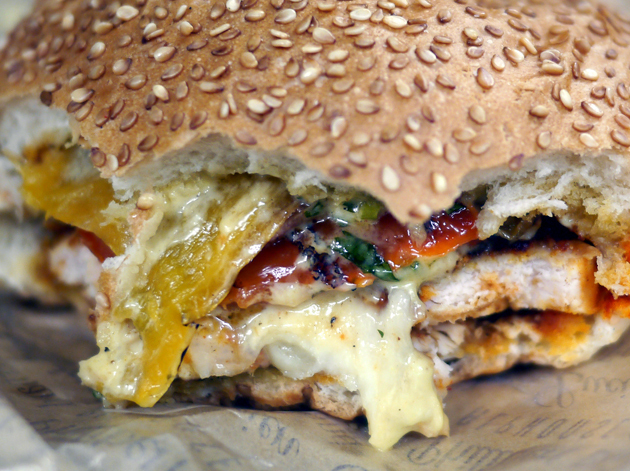 Unsurprisingly, breast meat forms the bulk of Big Fernand’s chicken burger, Le Philibert. Given dreary dullness of the chicken, I welcomed the distraction of the sweet, sharp and slippery peppers even if they also blocked out the tommie de savoie. Cold day in the sun. Opting for a barbecue sauce-less Le Bartolome proved to be a disappointing experience. The bacon was less crispy but no fattier, while the chives and raclette were both less punchy. 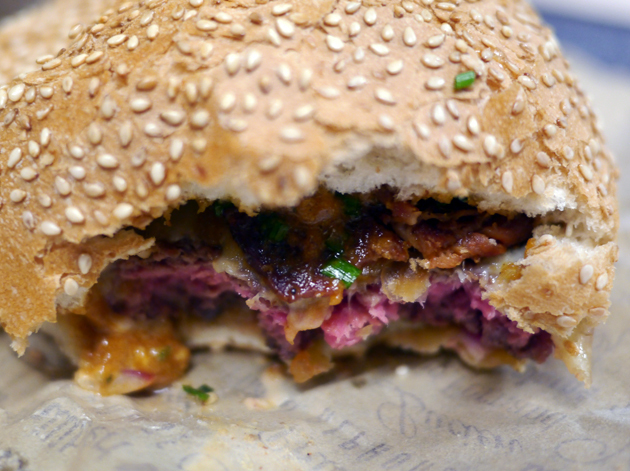 The caramelised onions still packed a wallop though, leaving the beef patty in the shade. Today’s procrastination was brought to you by the Foo Fighters. The kitchen seems to have real trouble cooking the chips to a consistent and high standard. 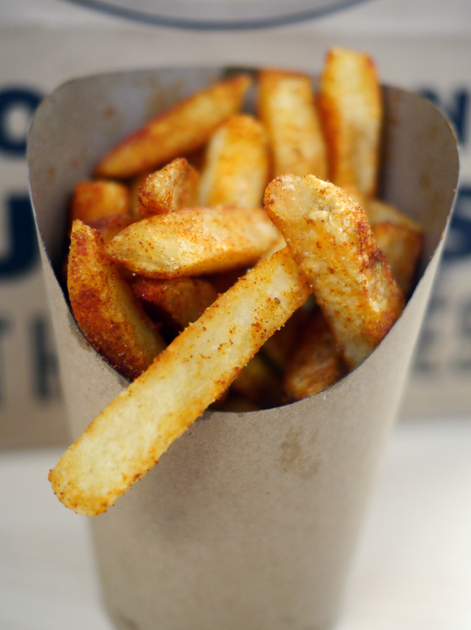 One batch was noticeably improved from the first time around, with every chip perfectly and pleasingly crisp. A second batch reverted to the unwanted and excessive softness of before, while a third was mercifully less salty albeit still very soft. Ils ne sont pas frites. 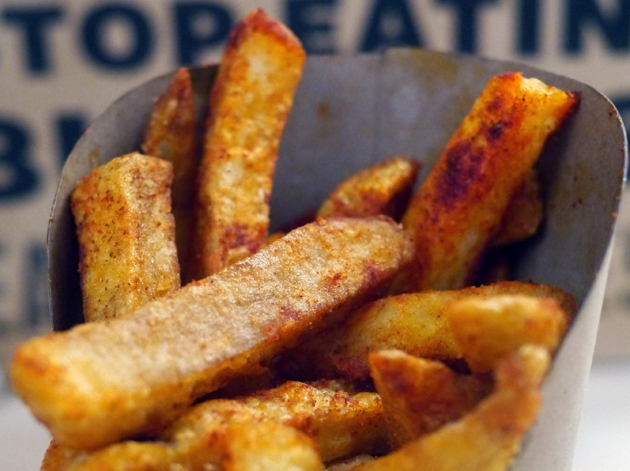 If you want, you can dip your chips in myriad sauces – none of which were particularly memorable. Chipping away at the old grindstone. Veal has always seemed like an odd choice for a burger meat to me, as its characteristic tenderness is often lost when it’s been minced or pulverised into a patty. The veal used in Le Victor was noticeably lighter than Big Fernand’s beef patties, both in colour and heft, with a loose, mildly coarse grind. I could’ve done with less of a bludgeoning from the very sweet caramelised onions and more of the blue cheese tang from the fourme d’ambert. The baby cows didn’t die for nothing. Well, mostly. I was hoping for a more pronounced Maghreb influence in the the lamb-based L’Alphonse given the intertwined histories of France and North Africa. The most exotic it got was pairing fleshy aubergines with smoothly ground and very lightly earthy lamb patty. Fresh coriander was present while the tommie de savoie added a rounded creaminess. A rather underwhelming burger. Are there inside jokes to Big Fernand’s names that we’re not privy to? The ironic thing is that, underneath all those misguided toppings, are some good quality patties. Taking advantage of the ability to order a customised burger, I order two plain, unadorned burgers – one beef, one veal. Both were cooked perfectly medium rare with lovely pink centres. 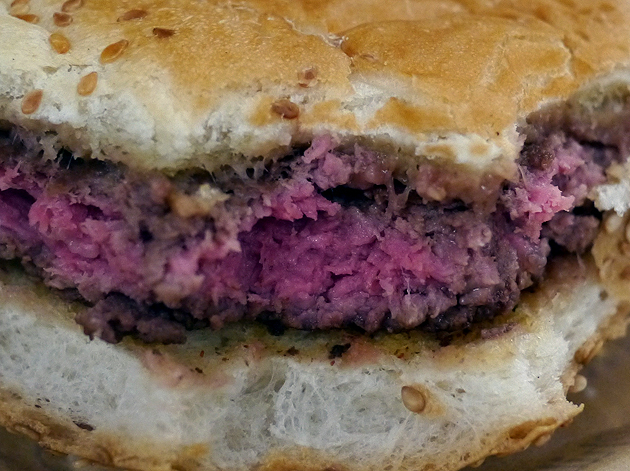 Both were finely ground, slightly chewy and tender – the veal patty noticeably so. The veal was also naturally and gently sweet, while the beef was pleasingly, mildly seasoned. Annoyingly, I’ve misplaced my plain veal burger pic. Oh well. 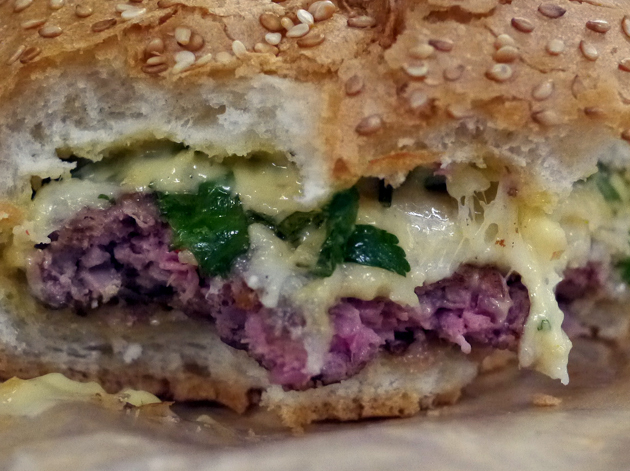 Big Fernand’s burgers are by no means bad, but they’re rather muddled, half-way house affairs. The quality patties are obscured in almost all cases by sweetness from various sources. Waterboarding with sweetness may count as good taste in some quarters, but not mine. Another missed opportunity are the cheeses – French cheeses in a burger could potentially be a gloriously decadent, over the top thing, especially if you insist on overshadowing your meats. You’d never know it from the generally tame, pared down cheeses used here though. Rather than merely pipe bombing with raclette and tommie de savoie, why not go ballistic with a really stinky epoisses or an astringent roquefort? The seamless service at Big Fernand counts for a lot, but that just makes the merely so-so burgers all the more disappointing. 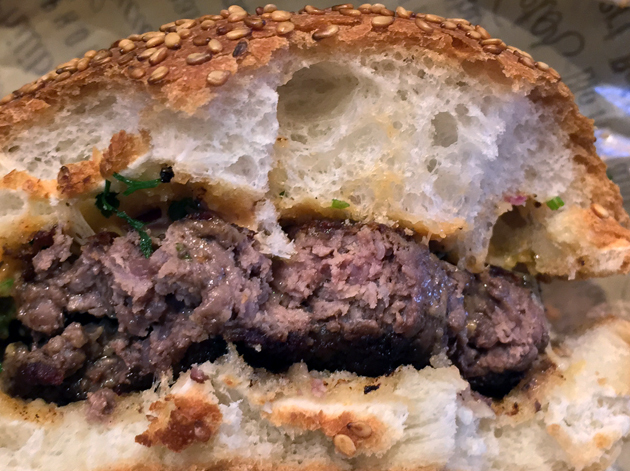 Big Fernand will doubtless continue to be popular, but this johnny-come-lately is just another burger restaurant rather than the meaty beacon of carefully balanced goodness it could have been. Opening Hours: seven days a week noon-14.30 and 18.00-22.30. Average cost of a burger: £7-10 approx. Tags: beef burger, big fernand, blue cheese, burger, cheeseburger, chicken, chips, lamb, london, mushroom, restaurant, review, veal. Bookmark the permalink.